Image: Chris Jackson/Getty Images Entertainment/Getty Images. The fundraising cookbook, now a best-seller, was created to support the Hubb Community Kitchen, and since its release in mid-September, it has done just that and so much more. According to Food & Wine, Together has sold more than 40,000 copies in the U.K. and has raised $270,000 so far. Internationally, it has sold tens of thousands more in sales. Due to the success of the book, the community kitchen is now open seven days a week instead of two, and the kitchen is now preparing 200 meals a day. These meals are delivered to local groups in need, including care homes, homeless shelters and women’s shelters. In just over a month, the kitchen has already been completely redesigned too. The day before Thanksgiving, Meghan visited the Hubb Community Kitchen and the survivors of the Grenfell Tower tragedy who inhabit it to see just how much the book has impacted their lives. 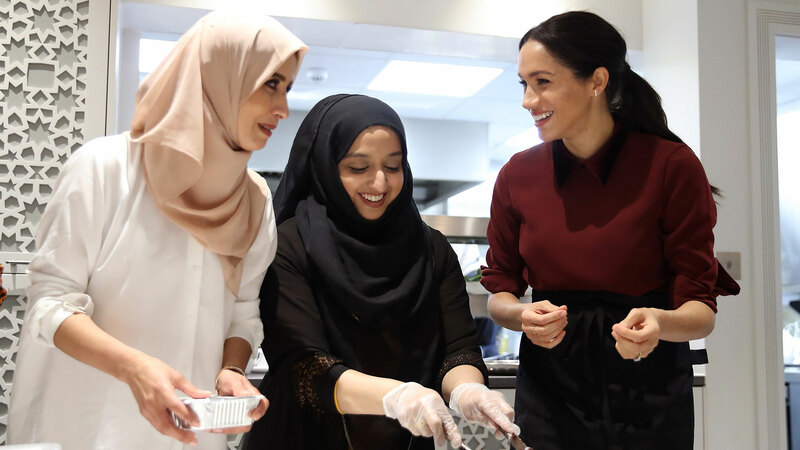 While there, Meghan, with the help of her friend and Michelin-starred chef Clare Smyth, helped cook veggies and rice and helped the women pack 300 meals for the local community, according to Kensington Palace. The women also shared their new projects at the community kitchen, including a project that will deliver nutritious meals for women in maternity wards and for women affected by domestic violence. While the women in the kitchen are very grateful to Meghan, the feeling is mutual. The cookbook, Together, and the Hubb Community Kitchen are clearly very close to Meghan’s heart. Plus, the duchess regularly visits the kitchen privately.